Biosint L-Carnitine is manufactured by Sigma-Tau Industries, S.p.A. (Rome, Italy), the pioneer in L-Carnitine science. Other Ingredients: Cellulose, magnesium stearate and silicon dioxide. Capsule consists of gelatin. DuraCarn L-Carnitine Fumarate is a superior, stable form of L-Carnitine and is 58% elemental carnitine. 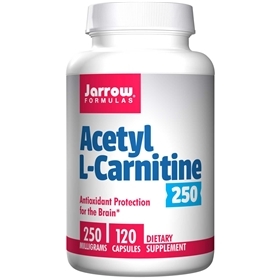 431 mg of L-Carnitine Fumarate yields 250 mg elemental L-Carnitine.